The challenging team might be dealt cards like this, from which they must choose one masterpiece card and one inspiration card to hand to the opposing team's muse. The hardest part of writing, I find, is deciding what to write. When inspiration strikes, the experience can be magical and also personal–so personal that the ancient Greeks personified the forces of inspiration as the muses. In Muse, you will similarly be giving and given inspiration, but the goal is less about creating masterworks and more about misleading the other team and not being misled yourself. How good are you at performing to strict parameters? Muse is waiting for you. Muse is a team clue-guessing party game for two to twelve players. Players divide into teams and try to challenge the opposing team’s muse to give difficult clues to teammates. The first team to collect five cards wins. The challenging team might be dealt cards like this, from which they must choose one masterpiece card and one inspiration card to hand to the opposing team’s muse. To begin, players divide into two or three teams. The surreal-art masterpiece and inspiration cards are shuffled and placed within reach. Then play can begin. Each round, one team is the guessing team, and another team will challenge the guessing team. The guessing team chooses one player to be the muse, who must offer the clue for the round. The challenging team draws six masterpiece cards and two inspiration cards and passes one masterpiece card and one inspiration card to the muse without the muse’s teammates seeing. The muse has to give a clue according to the parameters of the inspiration card that will lead his or her teammates to guess that masterpiece. After the muse gives the clue, the challenging team shuffles the muse’s masterpiece card into the other five and reveals all six to the muse’s team. If the muse’s team guesses the muse’s card, they get to keep the card; if they guess incorrectly, the challenging team gets to keep the card. The game ends when one team has won five cards. That team wins the game. Many reviewers talk about how we’re living in a golden age of board games, but I’m less convinced. Still, while that assertion is debatable, what’s less debatable is that we are living in a golden age of party games. Seriously: wholly new concepts or remixed concepts are being released each year, and just when I think I have enough party games, another excellent one hits the market, proving that yes, I do have space on the shelf for another one. It’s in this environment that Muse enters the scene. 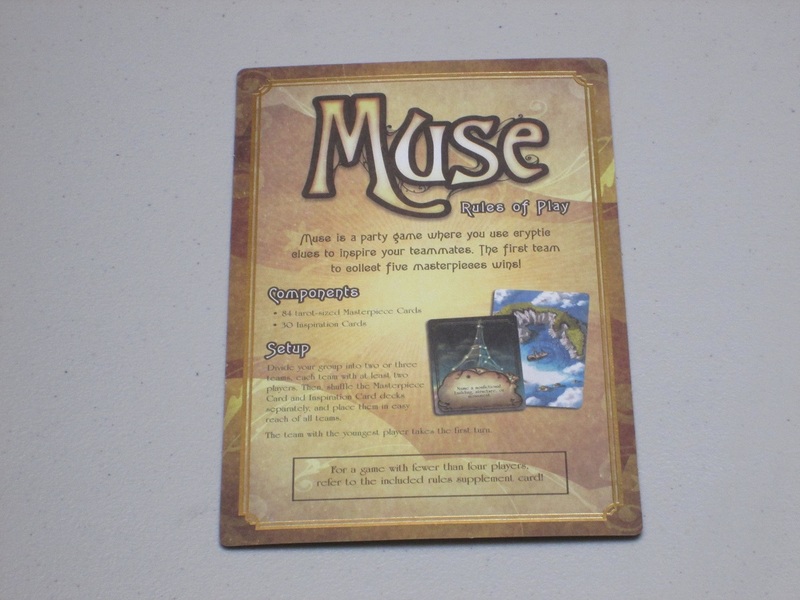 While Muse is definitely of the “remix concepts” variety, it still offers a new twist to party games and brings new opportunities for cleverness to the team guessing game. The challenging team might have chosen this pair. What clue would you give? 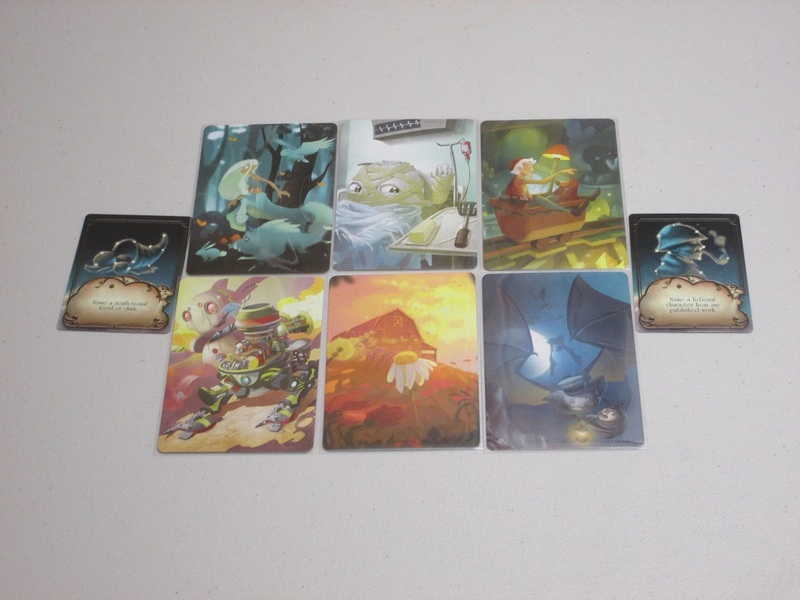 Muse, similar to many other recent titles like Dixit, Mysterium, and Codenames Pictures, uses surreal art cards that a player has to get their teammates to guess each round. We’ve seen this before. But what separates Muse from the pack is that the opposing team chooses both which card the muse has to give a clue for and the form that clue has to take. This form might be making a pose or humming a song or naming the title of a book, movie, or board game or one of thirty different options. Your friend who is a whiz at charades might have to think of a book title, and your bookish friend might have to hum, and your musical friend might have to pantomime. It’s hard to settle into a routine in Muse, and this is the game’s greatest strength. It’s also a strength that the challenging team is limited in its options. There are six cards to choose from, yes, and two inspiration cards, but the challenging team has to use the tools they’re given to stump the opposing muse. This keeps the game moving along at a decent pace. It also provides the best part of the fun of the game: seeing someone completely exceed your expectations. Inspiration cards are the clever innovation here. Muses can’t become comfortable in just one form of clues as there are thirty different cards. G.K. Chesterton once said, “It is impossible to be an artist and not care for laws and limits. Art is limitation; the essence of every picture is the frame,” and it’s this limitation that allows each muse to be more than just a clue giver but an artist. When you’re the challenging team, you’re trying to think of how you might possibly stump the muse. You’re thinking, What clue will they give for that? Besides, even if they do give that clue, there are enough other cards with similar items that there’s no way the opposing team will guess it. But then you see the muse work, and the clue you thought they’d give–the easy way out–lies unused on the cutting-room floor, and instead they give the perfect clue, and even when the other team guesses correctly, you’re still kind of glad that you got to witness your friends’ ingenuity. It’s moments like these that showcase Muse’s strengths. When it works, it works great, and even when the table does not break into spontaneous applause, there’s still the muted joy of witnessing your friends being clever. Which card would you guess for the clue “pillbug”? So that’s Muse at its best. Muse is undoubtedly a clever game, but there are some aspects of it that dampen my enthusiasm for it a little bit. First, while it’s neat that there are thirty ways that the muse might be called upon to give a clue, not all of these are equal. 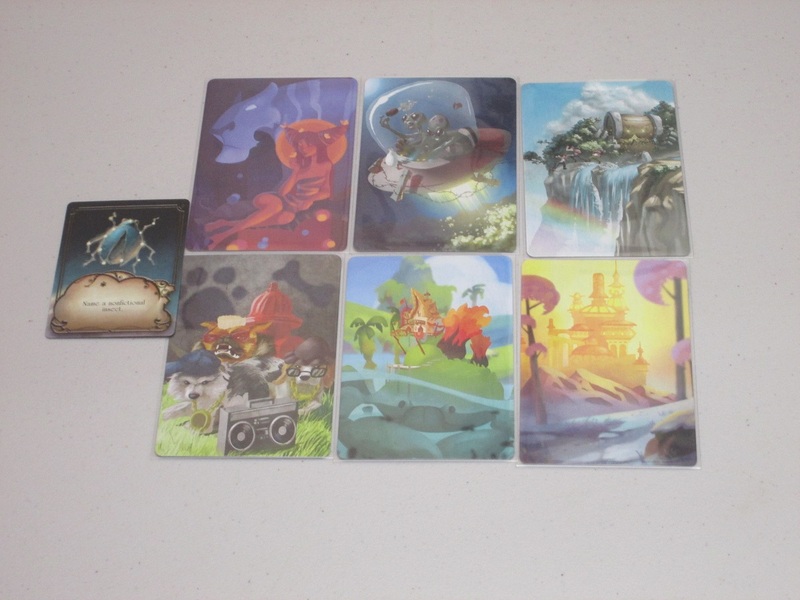 In one game, for example, I was given the inspiration card that I had to name a color of the rainbow. Hmmm… While I could be choosy in which of the ROYGBIV segments I named, there’s not a lot that can be conveyed in that. In another round, one of my teammates’ clues was simply to give a number. Contrast this with inspiration cards like “hum a tune” or “give the name of a book,” and you can see the discrepancy: it’s easier to convey more information, or have more ready options, in some kinds of clues than in others. 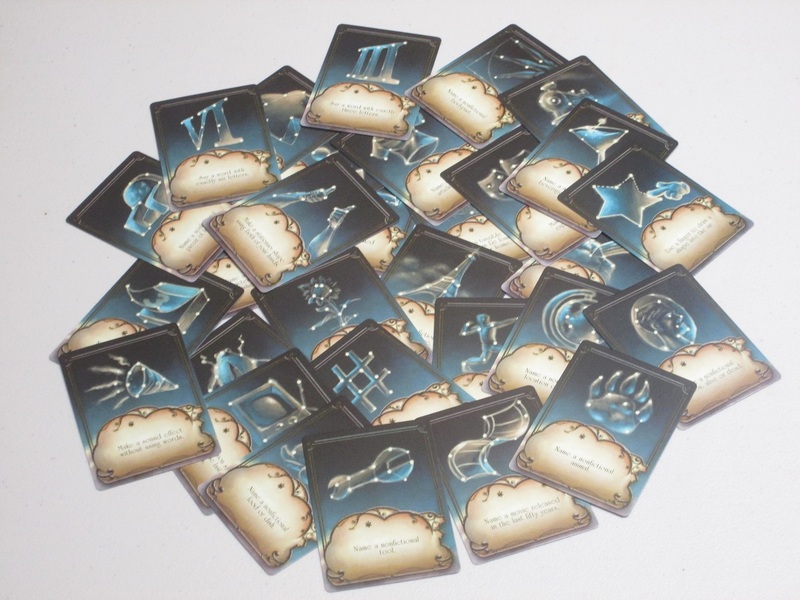 The game comes with 84 large-format masterpiece cards. The artwork is the showstopper in Muse. Beyond this, I would recommend including some kind of timer in Muse to discourage teams from taking too long to find the “perfect” match of inspiration and masterpiece card and to discourage muses from taking too long to find the “perfect” clue. Even though choices are (rightfully) limited, there’s still enough downtime without excess deliberation that, really, a timer is almost a must. The components in Muse are excellent. The title receives goldleaf treatment on the box, signifying that this is a product the publisher values, and that love and care is shown in the entire product. The masterpiece artwork is gorgeous and colorful. It’s similar to Dixit artwork in that it’s surreal. 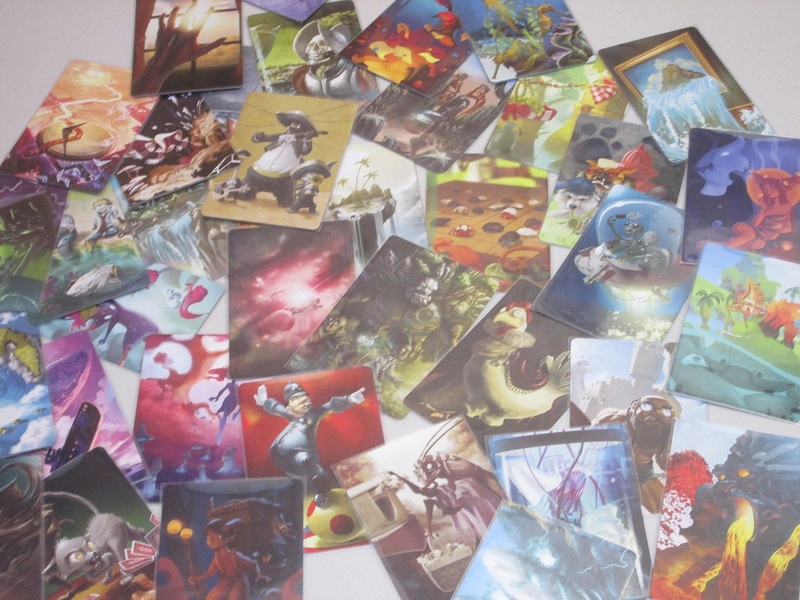 The artwork in Muse might be even stranger and darker than Dixit, closer to Mysterium. That is to say, this won’t be universally lauded, at least if your groups are like mine. I like it, though, and the large-format cards are the perfect way to show it off. 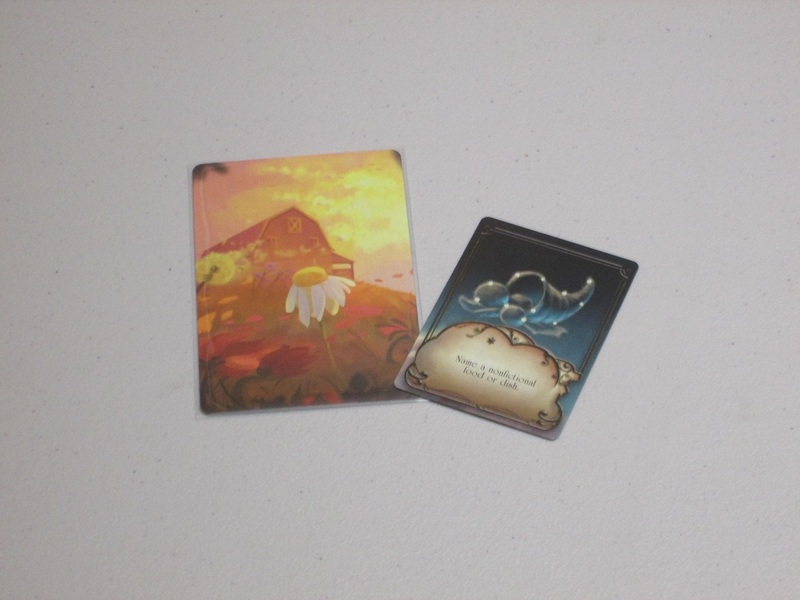 The inspiration cards don’t need illustrations, but they have them, which is a nice touch. My insert was destroyed in transit when I received the game–a shame, as it looked nice–but this isn’t a big deal. The box is small for a party game (think Codenames size), and it’s packed with good stuff. 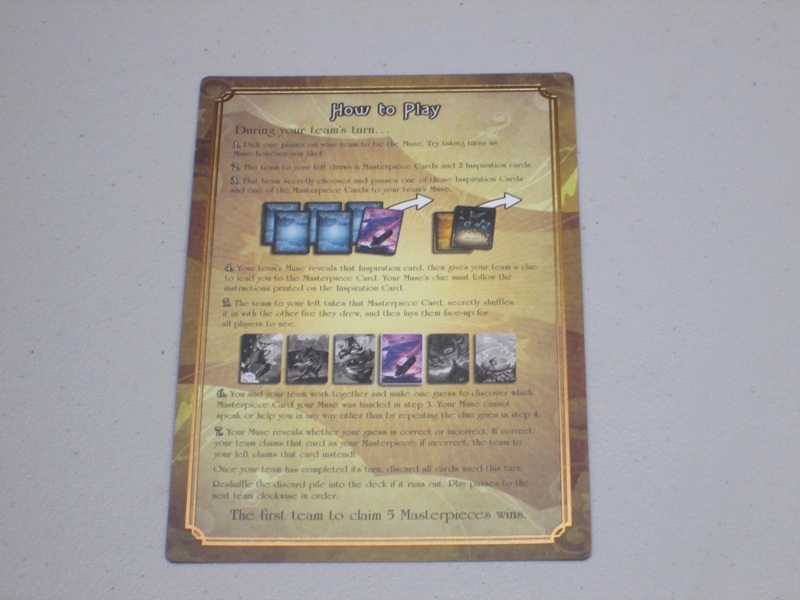 The rules are one cardboard sheet, front and back, and well illustrated, and the rules are clear from this. I love how simple this game is to learn and teach. …is simply one piece of cardstock, front and back. This is WONDERFUL. It’s super easy to play and teach and lives up to the publisher’s name–Quick Simple Fun. Muse is a fun game and a great system for making players think in new ways rather than relying on one trick–like being good with words or drawing or gestures. Instead, it asks players to draw from all spheres of knowledge and expertise to give clues. While, again, some of these inspiration cards are uneven in the amount of information they can provide to teammates, Muse is the kind of game you can easily tailor to your group. It’s not the game I’ll reach for if I’m looking for big laughs, but it’s also one I would never refuse and think is ripe for even more material, especially masterpiece cards. 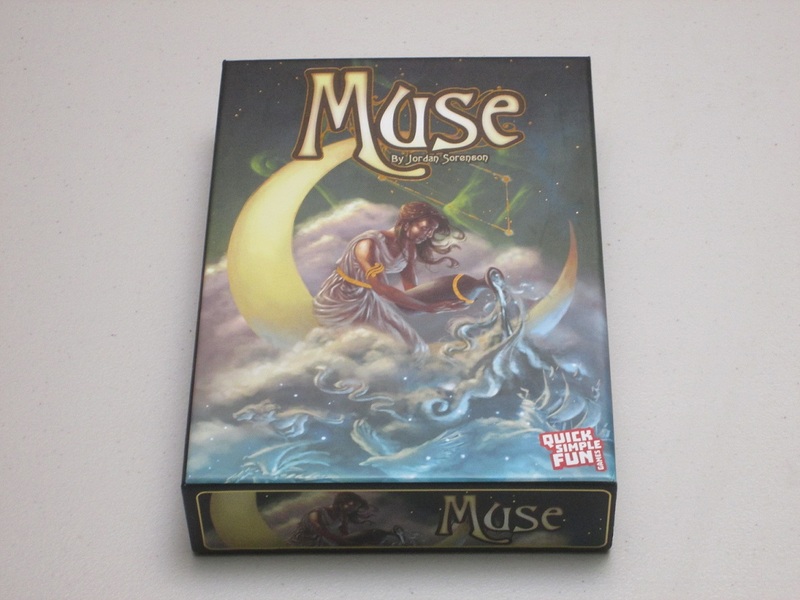 If you’re looking for a clever game for people who are quick on their feet, Muse will delight. iSlaytheDragon would like to thank Quick Simple Fun for providing us with a copy of Muse for review.